A view of the tropics may seem an unlikely subject to celebrate in a California artist but in the second half of the nineteenth century, when American artists began to travel in search of new and spectacular subject matter, the tropics of the Caribbean and of South and Central America became a popular minor subject. As a teenager in New York, Norton Bush studied painting with Jasper Cropsey, a well-known member of the Hudson River School of Romantic Realists, but it was advice from Frederick Church, from whom he took criticism, that inspired him toward tropical subject matter. (Church had gained considerable fame for his production of highly detailed, giant sized views of the tropics that, when put on public display, attracted lines of paying crowds.) After immigrating to San Francisco via the Isthmus of Panama, Bush produced tropical views. These attracted the eye of San Francisco art patron and banker William C. Ralston who sent the artist to Central America in 1868 to pictorially record Ralston’s business interests there. Bush later produced a series of paintings for Henry Meiggs’ railroad in the Andes. 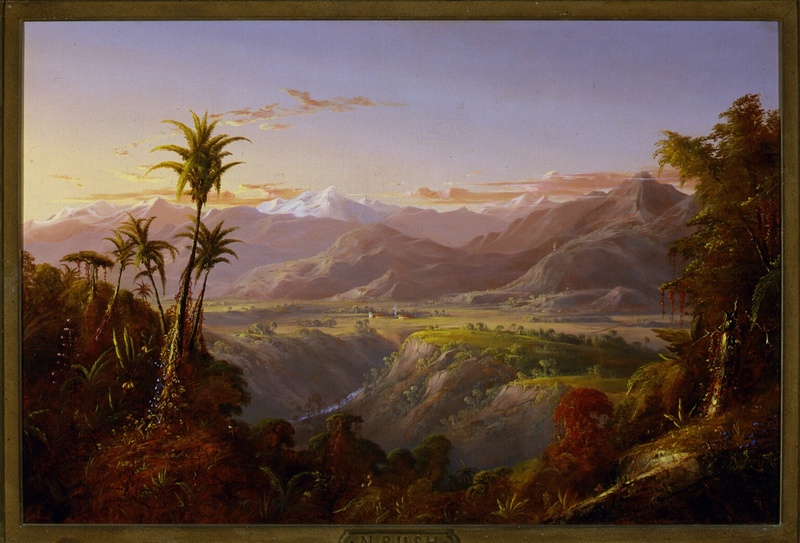 Bush’s transcription of the lush and exotic tropical vegetation was the most sophisticated of his several California contemporaries who essayed the subject. Buyers were those who had crossed the Isthmus of Panama on their way to California or had seen the tropics from ports of call as they sailed around Cape Horn or just had a romantic inclination. Untitled was painted in 1868 when Bush was at the height of his artistic powers. The large size, as compared to his many small (10 x 12 in.) paintings, allowed the creation of a vast landscape replete with detail and bathed with a romantic evening glow. The frame is original; and the stamp on the reverse of the canvas reveals Bush did his shopping for art materials at the San Francisco dealer of Snow & Roos. Provenance, exhibitions and publications: Property from the Estate of Caroline Huntington Holladay; Butterfield auction, December 12, 1996, lot 3019, reproduced in color in the catalogue; reproduced in color in Nancy Moure, California Art: 450 Years of Painting & Other Media, Los Angeles: Dustin Publications, 1998, p. 62; Exhibited: Gold Rush to Pop, Orange County Museum of Art, Newport Beach, 1998-99; Exhibited: A Lasting Legacy: Recent Additions to the Collection, Orange County Museum of Art, February 5 – May 21, 2000.